SHIFTboston blog» Blog Archive » How about Printing Buildings? The Additive Manufacturing and/or 3D Printing process is revolutionizing the manufacturing industry by allowing any size company, or individual in many cases, to manufacture quickly, locally and with far fewer costs. This simple process that builds things by depositing material, typically plastic or metal, layer by layer until the final product is finished, is used to make a number of products today including: jewelry, iPhone cases, shoes, automobile parts, jet engine components, prosthetic limbs and so much more. During the next decade this technology could transform the way we build buildings. Using additive manufacturing in building construction has already begun. 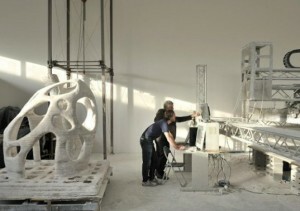 Janjaap Ruijssenaars, an architect in Holland has revealed plans for a 3D print building which is scheduled to be completed in 2014. The building, which he estimates will cost 4-5 million euros. 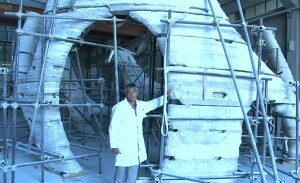 Mr Ruijssenaars is working with large-scale 3D printing expert, Enrico Dini on the project. Mr. Dini is an engineer and an educator from Italy who runs a largescale 3d print laboratory in the UK called D form. 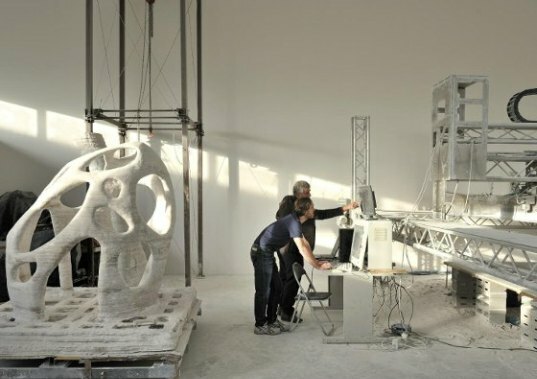 Mr Dini’s industrial sized 3D printer uses sand and a special binding agent to create a “marble like material” stronger than cement. But the 1,000-sq-m buildings would still require concrete reinforcements. There are a number of benefits 3d print offers to building construction, the first is that it can produce complex forms that would be difficult, time consuming, wasteful — and in some cases impossible — to make with current technology. 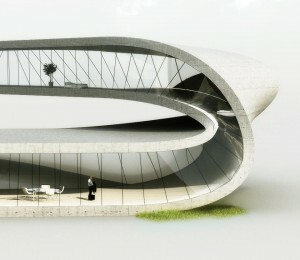 Janjaap’s building is a large, twisting organic form that makes a continuous loop. Constructing such a form using traditional construction methods would require routing styrofoam form work — a time and energy consuming process that results in a large amount of waste. I spoke with Mr. Dini to find out more about the use of large-scale 3d print technology in building construction. Kim Poliquin: Is the construction industry embracing this new technology? Enrico Dini: There is a large amount of interest in large-scale 3d print. I receive hundreds of inquiries per day from machine manufacturers, binder manufacturers, building construction companies, engineers, architects and others. The technology is in investors hands, I am aware of 7 investors that are currently working on business plans. It will however, take major transformations in the construction industry before printing buildings becomes a standard practice. Kim Poliquin: Will 3d printing become a standard construction method and what steps must the industry take in order for this to happen? Enrico Dini: I predict in 2020 we will be printing buildings. But, in order to fully integrate this technology, we need to start from scratch and rethink our current construction methods. It will involve a quantic jump because it does not exist so far. We must begin by demonstrating the viability of 3d print in construction by trying it out and evaluating the final product — this is what we are doing now. But Then we must devise a plan to make on-site 3d print more cost-efficient, this will involve coming up with a set of guides that optimize: transportation, labor and site logistics. For example how will the printer be transported and secured on site? And how must the site be prepared to accommodate this new mechanism? Also, all of the people working on buildings such as construction teams and laborers, must learn new skills in order to accommodate an entirely new way of building. New manufacturers, products and supplies will have to be developed and this will take many years. Kim Poliquin: How are you demonstrating its viability? Enrico Dini: Right now we are working on a few very small projects in South Africa where costs are low and experimentation is not limited by regulations. We are learning from the process, testing the technology and will be evaluating the buildings when they are complete. 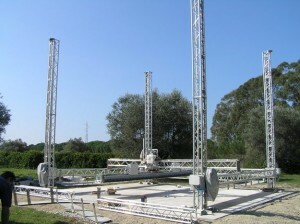 We are also producing a 3 meter stone form pavilion in the Italian Expo 2015, which will provide even more data. Kim Poliquin: How does the cost of 3d print technology compare to the cost of typical construction methods? Enrico Dini: Right now 3d print is much more expensive than traditional construction. The cost will come down considerably once the right business model has been developed and the industry is prepared for the new technology. Due to advancements made in 3d print technology, costs have already come down considerably since the idea was first developed 5 years ago. Kim Poliquin: What are the environmental benefits of 3d print construction? Enrico Dini:The most cost-efficient business model will be one that tailors the technology to regions. Regional specialization can optimize the use of materials and production in situ, reducing transportation and offering a number of environmentally sustainable benefits. For example, local rock and soil can be shaped into a building tapping into “traditional materials and methods”. This process, based upon the vernacular architecture tradition, can establish greater value in the buildings. Kim Poliquin: What materials can be printed? Enrico Dini: Almost any material can be printed: plastic, sawdust, tires, glass or metal, and post-processed materials. All print materials are made of 2 parts: aggregates which are the fill and binders which are essentially the glue that holds the fill together. Finding the right binder for the aggregate is the most important part of the process and it must be tested to ensure optimum performance. We are currently working with dolomitic stone and a magnesium binder, the result is basically sandstone. Regional specialization will simplify the material selection process as a set of aggregates and binders will be defined per region. In fact, we could begin testing regional aggregates and binders now by applying this process to small landscape applications. We could then evaluate these materials and identify the most promising combinations and have them ready to use in our buildings. Kim Poliquin: It sounds like a chemist or scientist must be involved in the binder selection process, is this true? Enrico Dini: Binders for readily used materials will have already been determined and tested. You will need to consult with a chemist or engineer to find the correct binder for a material that has not been printed. A consultant should be part of the material testing phase to help determine best local aggregate and binder per region. Kim Poliquin: What is the maximum area a 3d print can cover? Enrico Dini: Scale of the print depends on the embodiment of the printer. Our machine can cover a 16’ x 16’ x 6’ area, that is roughly 10-15 tons of material. However, printers can be sized to cover much larger areas than that, A printer could be sized to print an entire building in one shot, with no modulation. * Enrico Dini and his work will be featured in the upcoming film documentary ‘The Man Who Prints Buildings’ by Jack Wake-Walker and Marc Webb.